A conversation with Gene Youngblood at the World Wide Video Festival, The Hague, Netherlands, 1 & 2 October, 1990. The media must be liberated, must be removed from private ownership and commercial sponsorship, must be placed in the service of all humanity. We must make the media believable. We must assume conscious control over the videosphere. 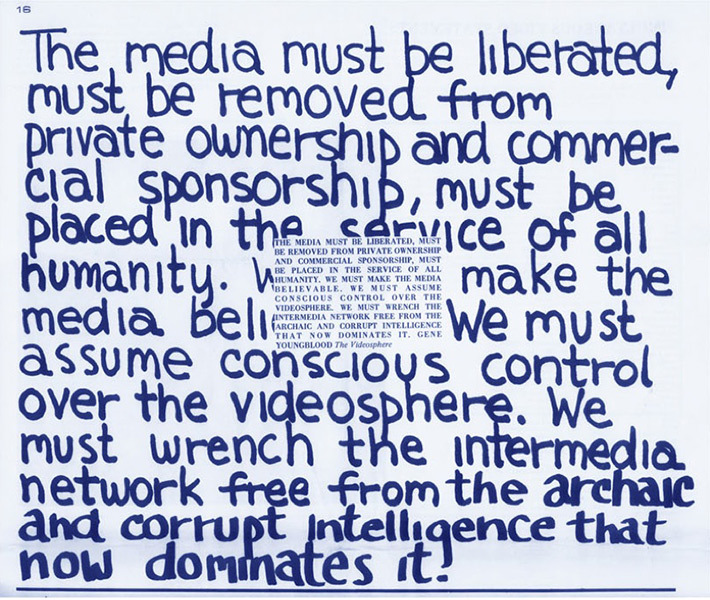 We must wrench the intermedia network free from the archaic and corrupt intelligence that now dominates it. The digital condition is beyond the wildest utopian dreams of 20th century media activism. It has created an eighth continent that is no more imaginary than America itself. It’s a revolutionary social metamedium, and millions of reality-communities are rising up on its phantom topology. They’re multiplying exponentially and we’re busy selecting among them, assembling our media lifeworlds…It’s the end of mass media and the social control that’s based on it. Consensual hegemony has had its run: the return to classic totalitarianism begin… It’s the end of mass media and the social control that’s based on it. Consensual hegemony has had its run: the return to classic totalitarianism begins. The architecture of tyranny is in place. The good hegemon is unmasked, truth-telling and dissent are criminalized, police are militarized, show trials are staged, the Panopticon rises over the eighth continent. The potential for radical democracy has never been so close, and, for that reason, so far away. And yet, in The Build there is reason for guarded optimism…It means creating an environment that makes secession and resocialization possible at scale. It means optimizing the commons for decolonizing our minds and cultivating radical will. It means producing content for countercultural media lifeworlds as technologies of the self, habitats that enable strategic counter-socialization. It means systematically subverting the imperatives of social control. I work at this ten hours a day, seven days a week, and I’m laying it in your lap. I’m handing you the secession algorithm. I’m calling your bluff, pushing you against the wall of your apathy and indifference, because secession isn’t optional. Not to secede, now that you can, is terminal hypocrisy. You don’t admit the culture is lethal and then refuse to leave it when such an impossible thing becomes possible. When an opportunity like this presents itself, a person of conscience doesn’t hesitate. Given the tyranny and chaos on the horizon, the only acceptable response is to throw yourself into The Build with ferocious dedication. Anything less is a betrayal of us all. Erkki Huhtamo: From the very beginning of your career in the 60’s you have been one of those rare critics who have written mostly about audiovisual media in the future, or in the future just becoming present. How did you adopt this kind of attitude? Gene Youngblood: It’s a deep love for the moving image. I’ve always been interested in the evolution of moving image language. To me video and computer graphics are just other forms of moving image art. I’m interested in the question: in what ways do these new technologies expand the possibilities of moving image language? But it has always been important to me that moving image practice should be personal rather than industrial. I’m interested in the amateur, not the professional. Someone who does it for love – that’s what amateur means – not for money, which is what professional means. That limits the kind of technology I’m willing to consider. Certain technologies are fashionable today; virtual reality and computer graphics, for example. But to the extent that they remain unavailable to individual artists, I’m not that interested in them. I’ve become increasingly politicized about the kinds of tools an individual artist or activist has access to right now, not in the future. Of course one can think a little bit ahead, maybe five years or something, but I’m not interested in talking about what might be possible ten years from now. High quality computer graphics has only recently become something middle class artists can afford, so I’m only now beginning to write about the aesthetic implications. There is very little that’s new in video and computer graphics that you could not also find in film. A couple of things are really new, but most of it you can find in photography and film. The question is not what’s unique to a particular medium, but what tends to be emphasized – what’s more easily done electronically than mechanically. People say, “I’m a video artist, here’s my video,” and they’re doing things that are not different from what’s done with film. They edit, they fade, they dissolve, and they say “Here’s my video art.” Or they say, “I’m a computer artist, here’s my computer art,” and I see things you could do in hand drawn animation. Why don’t they just say, “Here’s my movie”? On the other hand, there must be something in this new medium that needs to be explored, that has not been possible with film. What is it? Especially with digital imaging. What new possibilities are there? There are all these video effects. Almost everyone is using them as “special” effects, without a syntactical function. The challenge, as in any medium, is to turn effects into expressions. To give formal possibilities some kind of syntactical or linguistic function. Consider time, for example. Traditional cinema doesn’t have much of a syntax of time. There’s parallel montage and temporal punctuation like fades and dissolves, but in video you can have multiple images in one frame simultaneously more easily than you can in film, so you can at least suggest different temporalities even though the moving image doesn’t have tenses. Which is why some theorists say it’s not a language. That sort of thing interests me. If you’re interested in the formal possibilities of electronic imaging, it’s boring when an artist doesn’t explore them. People have to be more rigorous with the possibilities. Huhtamo: The media landscape has changed a lot since the 60’s, especially because of extensive global networking. This poses quite different challenges for the kind of personal making of moving images — Stan Brakhage for example — you wrote about in Expanded Cinema. Youngblood: When I wrote Expanded Cinema, you couldn’t see any of those movies I wrote about. Today I can rent them on video. To me the most revolutionary thing happening today is video publishing. Cinema can now be an art form like writing because of this revolution in distribution, which allows the moving image artist to address small, specialized audiences the way we do with magazines or poetry. The other thing is that production technology is getting very cheap. I’m thinking of Video-8 and digital audio. Pretty soon there will be digital Video-8, in the next five years, I think. So from a technological point of view, the distinction between professional and amateur is being erased, on the production side of it. We can produce works of excellent technical quality, with all these so-called professional effects, but we can do it as amateurs. Culturally, politically, artistically this is revolutionary. This could never happen in film. However, something still separates professional and amateur, and that is mass distribution. It’s one thing to publish your material on home video; another thing to work for “the broadcast” – that’s my word for television – which is an immersive environment 24 hours a day. The frontier now is individual access to mass distribution, whether they be cultural workers or political activists. Huhtamo: Do you see any way for the personal approach to find expression on TV? Will these two things remain separated? Youngblood: To realize its full potential, personal work has to find alternative distribution. This doesn’t mean it can’t work on the broadcast. By “the broadcast” I mean television as we know it today, including cable TV. Gradually we will find whole cable channels dedicated to artistic, political, independent, countercultural kinds of work, but of course it will be marginalized, contextualized as strange and Other. Over the last 20 years the question has been, “How can I get access to tools of production?” Today, high quality tools of production are relatively inexpensive. So the next question everybody’s going to be asking is, “How can I distribute?” It’s no longer about access to tools of production, it’s about access to networks of distribution. That is, access to community. Not “audience,” but community or constituency – people who desire what you desire, want what you want, see the world the way you see it. But a lot of social change can happen before individuals have access to satellites and fiberoptics. Every year I have more access to more alternative voices than I did the year before. Huhtamo: There has been a lot of discussion about camcorders opening access for ordinary citizens to the media, for example as sort of alternative newscasters for the news broadcast. Do you consider this an advance in the democratization of the media? Youngblood: Yes, except it’s at a very primitive stage. I don’t accept the ideology of broadcasting on any terms, no matter who runs it, no matter who’s speaking. If the most benevolent people in the world were running the broadcast I still wouldn’t accept it, because one voice speaking to everyone is not a democratic model, no matter how supposedly benevolent that voice is. It’s not democracy. It’s not acceptable. Sure, we’re going to see Hi-8 stuff more and more on television, and there will probably be cable channels that are nothing but that. Somewhere along the line that’s part of the revolution. At some point you’re no longer talking about the broadcast as we know it. You wake up and say, Look what we’ve done! We’ve got these special channels which are actually channels of conversation. I can program that channel just as much as “they” can. At the present moment it gets ghettoized in the broadcast, with “amateur video” programs that show people making mistakes and being stupid. Artists are the really good amateurs, but what they do isn’t called home video, it’s called “art,” which separates it from the real world. In any case, if the broadcast lets more of this in, at what point does that reach a critical mass and shift everything over? Maybe never, maybe someday. I can’t see any other path. Huhtamo: People have been trying to realize alternative cultural magazines on videocassettes, but the really successful ones always deal with entertainment, sports and so on. How can one find space for these alternative products on the market? How to keep them from being flooded by the more commercial ones or from little by little slipping into the mainstream? Youngblood: I hear people talking about this, but the things I’m interested in are not mainstream and they can’t be absorbed. I’m interested in very radical, alternative kinds of work. I don’t know what it would mean to say that this would be absorbed into the mainstream. Today experimental film is thriving, flourishing more than ever in its history. I’m talking about the cooperatives-Canyon Cinema in San Francisco, the New York Filmmakers Co-Op. They’re renting more films than ever, and artists are making more films. If they’re interesting to me, I don’t care who absorbs them. It’s either strong work or it isn’t. If it comes to me on prime-time television and it’s really strong work, great. But of course it doesn’t come to you on prime-time television, which is why I never watch it. There’s always interesting stuff that you’re not going to find on TV, but you do find it on VHS. I don’t expect the whole world to suddenly open its arms to counterculture, but each little bit is really wonderful. If, next year, five more artists are being distributed on home video, to me this is a triumph. Something that’s very encouraging to me is that artists are doing more political work. You find very strong work that’s visually interesting but also has social and political substance. That’s the kind of art that interests me. The cutting edge in American culture today combines art and politics. The essay form is exciting in this regard, like Vanalyne Green’s A Spy in the House that Ruth Built or Steve Fagin’s The Machine that Killed Bad People. Fagin’s tape is remarkable for blurring the boundaries between art, documentary and fiction. Huhtamo: What do you think about the development of a figure like Nam June Paik? In the 60’s his approach to the technology-his first robot, the “participation TV” pieces, the early videotapes-was a very personal one. What do you think about him now that he has really made it to the dominant media and the established art world? Youngblood: I don’t think Nam June is doing anything different than he ever did. He just became rich doing it. I never thought of him as a video artist. He’s a philosopher, a a conceptual artist, and a businessman. Nam June was one of the first artists to use video, but I don’t think his tapes are very interesting. Huhtamo: But he was one of the first artists trying to use satellites in an artistic and personal way. I am curious to hear your opinion about his satellite projects. Do you feel that it is, on the whole, possible to use a satellite in a personal way? 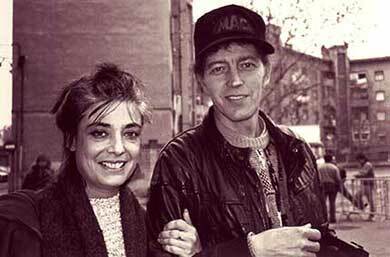 Kit Galloway and Sherrie Rabinowitz at Art Futura, Barcelona, in January 1991. Photo: Erkki Huhtamo. Youngblood: For four years I’ve been working on a book called Virtual Space: “The Challenge To Create On the Same Scale As We Can Destroy.” It’s about the idea of a communication revolution. In America we grew up in the 60’s and 70’s with the mythology of a “communication revolution,” which was perpetually about to happen. I never stopped being interested in that idea. My book has two parts. One part is my theories about the idea of a communication revolution. The other part is the work of the telecommunication artists, Kit Galloway and Sherrie Rabinowitz. “We must learn to create on the same scale as we can destroy” is their credo, their manifesto as artists. I think this book will be pretty influential, because the big question in the 1990s is going to be, how can we communicate in a different way? In that context, Nam June’s use of satellites is trivial, uninteresting and counter-revolutionary compared to what Kit and Sherrie do. They create democratic telecommunication possibilities in public spaces. For example, the project they did in 1980 called Hole in Space. You’re walking down the street in New York and you look at a store window and there’s a 12-foot video screen with full-scale human beings on it. They’re looking at you and you look at them and you realize they’re 3000 miles away in Los Angeles. In another of their projects, called Electronic Café, Kit and Sherrie created a public multimedia telecommunications network. You walk into a café and you can send and receive video, computer texts, still video frames, handwriting and drawings to any other place where they’ve installed this equipment. The technology for public multimedia telecommunication is here. Kit and Sherrie used the telephone network. You don’t need fiberoptics. Now they’re working on Electronic Cafe International, which will have Moscow, Paris, Los Angeles, Sydney, Tokyo, Toronto connected by satellite. And in each city you will be able to send and receive motion video, still frame video, handwriting, drawing, computer text, sound – the whole multimedia thing – as an autonomous artist, just by walking into these cafes and doing it. That’s political empowerment. It’s about teaching people the skills, giving people the experience to make up their own minds about what they want and don’t want. In contrast, Nam June operates like an international art star and we passively watch him do his so-called interactive satellite events, which aren’t interactive at all. I mean, we see this every day on television, so we aren’t learning anything from Nam June. He’s always cute and I like him a lot personally, but his work is very bourgeois. Huhtamo: According to Wulf Herzogenrath, the problematic thing with satellite experiments he participated in was the difference between being a participant in the studio and being a spectator in front of the screen at home. The TV medium melts everything together on the screen, so that you have no way to tell whether what you see is staged or a real satellite connection. Only in the studio he could be sure that the connection was actually happening between different localities. 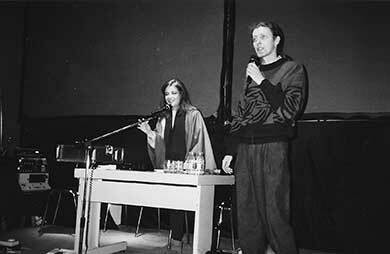 Kit Galloway and Sherrie Rabinowitz lecturing at Art Futura, Barcelona, in January 1991. Photo: Erkki Huhtamo. Youngblood: That’s why Kit and Sherrie put it in the streets for the people. Everybody’s in the studio because the world is their studio. 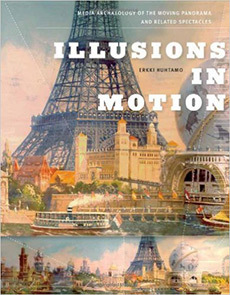 I ask myself, how can I, as a theorist, make the most important contribution to the evolution of the moving image? My answer is to not talk about the moving image at all, but to step up to the next level, which is about context, not content. It’s about connection and community. The more we do that, the faster the moving image will evolve. Four years ago, when I started writing this book, I called it “Virtual Space.” Nobody was talking about virtual reality at that time. Virtual space is the space of telecommunication. When we talk on the telephone, in our minds we occupy the same space. Your voice and my voice are in the same space, which is virtual space. Virtual reality is something else. In the festival catalogues they say virtual reality will be the new media phenomenon of the ’90s. That depresses me. It’s nothing but corporate marketing. Very expensive stuff that’s not going to be used artistically for a long time. It’s just sci-fi. It’s worshipping technology without any political awareness. I’m trying to make people think about talking to people rather than talking to computers. Huhtamo: Does the concept of “art” make any sense in the case of Kit and Sherrie’s work? Kit Galloway and Sherrie Rabinowitz: Satellite Arts Project. A Space With No Geographic Boundaries (1977). Youngblood: Kit Galloway and Sherrie Rabinowitz are admired around the world for their dedication, over a period of 15 years, to creating models of democratic telecommunication. They chose a field of activity for which there is very little support, very little recognition. Few critics know how to write intelligently about it. In my book, I’m proposing a new theory of the avant-garde. I’m basing it on two interpretations of the idea. One is The Theory of the Avant-Garde by Renato Poggioli. It’s the standard text on the subject. The other is Peter Bürger’s Theory of the Avant-Garde. Both are about the historical avant-garde, the Dadaists, Futurists, Surrealists. Poggioli is the weak interpretation – it’s all about rebellion, subverting popular language, being culturally transgressive, and utilizing the latest technology. Poggioli’s avant-garde is the one that’s been totally rejected. It’s dead, the way God is dead. But Peter Bürger says this is an incomplete understanding of the historical avant-garde. He says their project was to destroy the social institution of autonomous art and merge art with life. In other words, we should understand it as a political project based in art. To merge art with life meant actually to create a new way of life, a new social structure. Of course they failed. They succeeded in revolutionizing art, but they failed in the larger sense, which of course was inevitable. They did not have the means to do this grand thing. We should remember that the avant-garde began not in art at all, but as a political movement in Paris in the 19th century. When Baudelaire wrote about an avant-garde, he was referring to politics. But after the Paris Commune, that conception of avant-garde gradually shifted over to the art world little by little, until it finally came to mean only art. Today we say there’s no more avant-garde. Or even if you still use this word it has a trivial meaning. It’s about fashion, the latest trend. So everyone agrees the avant-garde is dead. But I say a society cannot live without an avant-garde. If you take it in its fullest meaning, avant-garde signifies the possibility of transcending what is. It’s the next way of being in the world, whether that is cultural or political. A society that has lost the hope of transcendence has lost its soul. So if the avant-garde is dead in art, we have to find it somewhere else. And that “somewhere else” is the political arena where it began. This doesn’t mean there’s no role for art. It only means that any avant-garde we can believe in and embrace in the 21st century will not be the one that characterized Western culture in the 20th century. It has to be something else. I call it metadesign. It’s where you create context, not content. Let’s look at two examples. One is software design. The software designer creates computer languages and applications that are environments, contexts for creating content. Let’s say you write a word processing application. This is context, it has no content. The user creates content that the metadesigner makes possible but does not determine. The same applies to graphics and interactive environments, where there’s a possibility for interactions that aren’t entirely specified, only partially. Kit Galloway and Sherrie Rabinowitz: Hole in Space: Interactive Communication Sculpture (1980). But there’s another kind of metadesign, which I call “social metadesign.” It’s what Kit and Sherrie do. In their work there are no signs that say “this is art.” People just enter the environment and begin to acculturate it, to define it for themselves. You could call this art, which Kit and Sherrie do, or you could not call it art, which they also do. They call themselves “new practitioners.” They think of themselves as artists, and they say they’re bringing artistic discipline to the design of communication networks. But ultimately it doesn’t matter to them whether it’s art or not, and it shouldn’t matter to us. This is a very interesting expansion of art that becomes a new way of being in the world. What has this got to do with the idea of an avant-garde? First of all, it’s obviously political. A core issue of social control is: Who can talk to whom, about what, under what circumstances, for how long, at what scale? This has been at the center of social control throughout history. In that sense, you can think of social metadesign as a discipline that merges art and politics in a way that has never been possible before. A work of art by itself cannot be political. Only situations are political. Only circumstances are political. A political context politicizes anything that occurs within it. If you have a political situation, then anything done within that context appears to be political automatically, regardless of whether it was intended to be political or not. 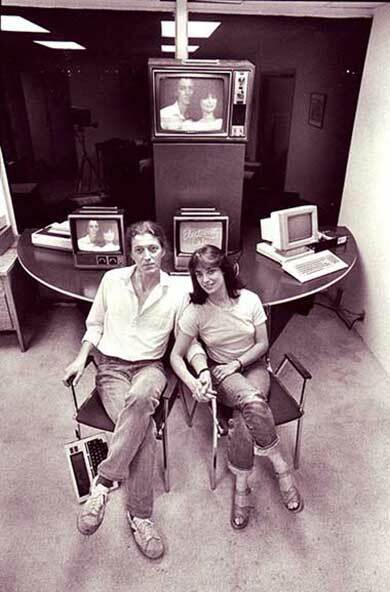 Kit Galloway and Sherrie Rabinowitz with the prototype of the Electronic Café International (1984). Kit and Sherrie are merging art with life in a way that’s much more useful and meaningful than traditional art practices. Some of the people who come into their telecommunication environments may be artists in the traditional sense; but when they start using that system, an alliance is formed between them and Kit and Sherrie as the metadesigners. This alliance is the new avant-garde. It’s not one or the other, it’s the two combined. It’s the alliance of the traditional artist and the new artist, the metadesigner, who makes the new activity possible but does not determine it. The artist determines the meaning of the environment at any moment. This alliance satisfies all the criteria that Peter Bürger is calling for when he says that the historical avant-garde wanted to destroy the social institution of autonomous art and merge art with life. There has got to be more people like Kit and Sherrie, who design social metamedia. Educational and cultural institutions can participate by funding these experiments -making physical space available and paying for the telecommunication services. Kit and Sherrie have demonstrated that it’s something we can do now. We don’t have to wait for fiberoptics. Huhtamo: Don’t you think that the authorities would sooner or later try to regulate this kind of activity by legislation? Youngblood: I want them to try. This is the fundamental question of power; consequently it has never been permitted to rise to the surface as a foreground issue. If you look at all of the significant countercultural discourses since World War II -feminists, environmentalists, ethnic and sexual minorities – all the voices of the oppressed and marginalized. They all beg the question of a communication revolution. If you take their arguments to the end, it’s all about control of reality by controlling meaning, by controlling context. It’s the control of context which positions women in a certain way in history. It’s the control of context which says that certain minorities are inferior. A communication revolution is precisely directed at that issue. How can we have a social world in which we control the context of meaning and therefore control reality? This is the underlying issue of all these problems. Control of context is the control of meaning is the control of reality. It’s also about political mobilization and activism. The more you realize that there are millions of people out there who think the way you think, who desire what you desire, you are more inclined to do something about it. Of course the power elite will resist it, but that’s exactly what we want. Because up to now these things have not been understood as communication problems. Feminism, gay rights, the environment, these are not understood as problems that can be solved only through a communication revolution. So we need reaction from the authorities to bring that into focus. Once these public issues are seen as requiring a radically new kind of public communication, we have won the battle. The struggle will begin in earnest at that point, but we will have already won, no matter how long it takes, because what’s at stake will be clear to everyone. Huhtamo: The question of legislative intervention by the authorities is interesting also, if one thinks about the Gibsonian idea of a matrix, a shared cyberspace. Youngblood: I want to stay away from language like “cyberspace.” I don’t want that associated with what I’m doing because it has an aura of sci-fi that’s more about machines than people. Huhtamo: But we might speculate that as the experience of virtual reality becomes more common, it might lead to some kind of legislative measures. We could play on the analogy of this experience and the experience of psychedelic drugs in the 60’s. The authorities reacted to that attempt to expand vision and consciousness. Something like this might happen again. 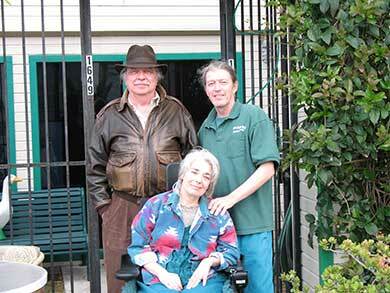 Gene Youngblood with Kit Galloway and Sherrie Rabinowitz at the Electronic Café International, Santa Monica, c. 2003. Photo: Gene Youngblood. Youngblood: Well, altered states of consciousness is precisely what we’re talking about, if by that you mean something like “mindset.” So in that sense you’re right. The last thing power wants us to do is “change our minds,” so to speak. But it’s not that simple. The new telecommunication possibilities will be essential for the economic health and growth of any nation. The society that allows its people the greatest freedom to communicate will be the richest and most powerful. We’re entering an age of “knowledge economies,” and you generate knowledge through conversation. Knowledge is a dynamic process that’s continually regenerated through creative conversation. What kind of legislation is going to prevent that without subverting the whole economic substructure of its own society? How are you going to control who can send a fax or a video image or a computer text without monitoring every single instant of the use of the system? I don’t believe that’s going to happen. We have just had the most dramatic example of this in Eastern European countries. They’re destroyed as economies precisely because of totalitarian control of the possibility of communication. We are not about to repeat that any time soon in the Western world. Huhtamo: What do you think about the validity of McLuhan’s ideas in the present situation? Your ideas have often been mentioned as having been influenced by those of McLuhan and Buckminster Fuller. Youngblood: McLuhan gave us an enduring slogan, “The Medium is the Message,” and an indelible image, “The Global Village,” but there’s controversy over what they mean. We have to define them for ourselves as we decide how to use them. McLuhan was politically naïve, and of course he’s no longer respected in academia by those who wouldn’t have their jobs if it weren’t for him. Regarding the first one, I ask myself, okay, the medium is the message; that sounds right, but what do we mean by “the medium”? I say the medium is structure as ideology. We have something called television, which is an abstraction. It’s neither a technology nor a medium, it’s just the idea of seeing at a distance. It doesn’t specify any of the ways we might do that. It says nothing about being a medium. So you have a technology – television – and then you have a medium, which is the way you structure television. The structure is not only technological, it’s also ideological. It is economic and political ideology. It’s what theorists call “the apparatus.” So the medium is structure as ideology. In our case it’s the ideology of mass broadcasting. We have created a structure, a medium, which says there should be one voice speaking to as large an audience as possible in order to sell that audience to the sponsors of the voice. A communication revolution would implement an inverse ideology. Instead of broadcasting we’d have networking. Instead of mass communication there would be group conversation. That structure would also be ideology, but a different kind; a democratic ideology. That’s one very useful thing McLuhan gave me. “The Medium is the Message” led me to that realization. On the other hand, “Global Village” isn’t very useful. Global connection doesn’t make the world smaller, it makes it infinitely larger. Huhtamo: What is the role of utopianism in your thinking about the communication revolution? Youngblood: I embrace utopia in my book on Kit and Sherrie, but in a different way. There’s a chapter called “The Utopian Myth of a Communication Revolution.” I mean that in a positive way. Back in the 1920’s and 30’s, Bertolt Brecht talked about a utopian use of radio, which he thought should be a two-way medium. He said, ‘I guess you think this is utopian, and I admit that it is. But I ask you, why is it utopian?” He was throwing the question back on politics. He was saying, technologically we can do it, economically we could do it, but culturally and politically we aren’t going to do it. Why not? Usually when people say, Hey, that’s utopian!, they’re not saying it’s impossible; they’re saying it’s not permitted. Well, that’s not enough for me. I start with the proposition that our problems are caused by the institutions that were supposed to prevent them. Those institutions cannot provide the solution. You can’t use the existing communication system to solve the communication problem. It’s the source of it, so you have to create new communication possibilities. But then you have a chicken and egg problem. How do we become, psychologically, the kind of people who would be willing to face this challenge? You need to go through a resocializing process, and for that you need 24-hour access to communities that validate and re-enforce radical desire. That requires a communication revolution. Yes, that’s utopian, but it’s the only thing left. Every other possibility for change has been denied us. All of the “reasonable” non-utopian avenues lead directly to the very institutions that are causing the problems. Huhtamo: Do I understand correctly that you are proposing a two-level model? On the one hand there will be the dominant big media, like broadcast television, official network systems, satellite control and so on. On the other, there will be the much more direct, two-way, multi-way communication, a variety of alternative networks, user-controlled systems. What kind of communication, if any, will there be between these two levels? Or are they sort of parallel realities? Youngblood: Whatever it may be, it’s going to take several decades. During which we have a reason to live. It incentivizes and energizes alternative culture with a project that has enormous potential for democracy. The best guess is that network culture will evolve alongside broadcast culture. As fiberoptics becomes widespread there will be legislative battles about the key issue – universal toll-free access. We should not have to pay for time on the network, just as we don’t pay for distance on the highway. Nobody is talking about this. It’s not an issue. If I want access to information as a commodity, maybe I should pay for it. But if what I want is access to conversation, access to community, why should I have to pay? What kind of democracy would charge me to be part of a community? People who think they are hip go around talking about the information age and access to information. That keeps us in a world where we have to pay for things. But if you talk about access to community, as long as we have to pay for every minute on the electronic highway we won’t be a community, because we won’t be able to afford it. Only corporations can afford it, and they already have a global culture. They’re the ones using satellites and fiberoptics. They’re the ones who bypass the telephone company. There’s no global people’s culture in the same sense. No global counterculture, feminist culture, environmental culture, because we have to pay to talk to each other. That’s going to be the legislative wars. We can consider ourselves evolved and aware only insofar as we understand our individual issues in terms of that overarching challenge. That’s the politics of the future. Huhtamo: Will the development lead toward integration of the ‘languages’ on a global level or will there still be a lot of diversity? Youngblood: If I sound like I’m predicting things, I apologize. I’m not trying to predict anything. I’m only saying, here’s the apparent problem; what possible solutions does this problem suggest, whether or not you think they’ll be successful. One admits up front that they probably won’t be successful, and yet one believes nothing else is viable. So I won’t predict, but I agree that globalized corporate culture seems to be an homogenizing force. So I ask myself, what would be a counterforce to this? I think countercultural multimedia conversation on a global scale would do two things simultaneously: it would create one language through which we could somehow understand each other, and at the same time it would diversify language. It’s the only possibility of maintaining cultural diversity in the face of globalized capitalism. That’s not a prediction. I’m only saying that’s the democratic goal. If one believes these strategies would not achieve it, then one is obliged to come up with another strategy. Huhtamo: A Japanese media critic was asked if she thought anything like the Rumanian television revolution would be possible in Japan. She burst into laughter and said, “Perhaps, if the revolutionaries would be very good in marketing research; they should research the ratings, then choose one of the tenths of competing channels, take over the station, concentrate their activities on the prime-time,” etc. In Rumania there was only one national TV-channel available. This is only to remind that the media landscapes and the possibilities of intervention are still very unequal in different parts of the world and will remain so far into the ’90s. Youngblood: Think of the language we use within our subculture here. We use words like “intervention,” “appropriation,” “subversion” – familiar terms in the art world. I think they are counter-productive thought models. I’m not thinking about subversion, I’m thinking about secession. Not intervening in the broadcast, but creating alternative possibilities for conversation. Let the broadcast run. Ultimately secession may mean the same thing. It’s an intervention, but at a higher level than just the broadcast. The way we think about things determines our action or inaction. Nobody imagines really intervening in the broadcast. It can eat anything you give it. You do not intervene in the broadcast. You do not appropriate or subvert the broadcast. You secede from the broadcast and create another way of being in the world. The goal is to have an alternative social world as massive as the broadcast. It’s not a matter of just turning the broadcast off. There has to be somewhere else to go that is equally massive, so that you can secede from this world and join that one, and have another place to live. The Japanese critic was wrong in saying they’d have to seize a channel. The channel has to be given to you. Seizure is impossible. This is the utopian part of my argument. The revolution has to be legislatively authorized or it isn’t going to happen. Huhtamo: How do you see the future of cinema as a public spectacle? Youngblood: That’s the right word. You will go to movie theatres for spectacle. Star Wars kind of stuff, maybe 3D. That will be one kind of cinema. Then there will be smaller venues, people’s video theatres. Cable-TV will get more specialized, as will VHS publishing. There will be the alternative video networks I’ve been describing – what Kit and Sherrie call Electronic Cafes, which I think of as secession cafes. It all comes down to fiberoptics. Are we going to replace the whole existing telephone and cable system with switched fiberoptics? That, also, will be cinema. In this scenario, I have a touch-tone phone that controls all of my media. The broadcasting networks will just be numbers on your touchtone pad. You and me and this video festival and the broadcast are all equal. We’re all just numbers in the book. So I dial you up to see your videos. That, too, is cinema, but a different kind. It’s the people’s audiovisual conversation. All kinds of videos, experimental films, and political works flow on these networks, right alongside CBS. That will greatly accelerate the evolution of moving image language. It will greatly accelerate people’s visual literacy, how to read complex audiovisual texts. It’s all cinema, including virtual reality goggles. If that gets sophisticated, unlike what it is today, it will be incredibly powerful. I understand why people are fascinated by the idea of virtual reality. But it’s too far in the future to be political so I don’t waste my time thinking about it. You could imagine connecting a VR headset to a global network so that you and someone in Tibet are working on some virtual object in the same virtual space. It’s already possible to draw the same picture together on your tablets. The same lines meet. Kit and Sherrie already do that. VR is just an extrapolation to a higher level of technology. That’s terrific, I’ve nothing against that. It’s just that right now all they can imagine is putting on a $70,000 helmet and stumbling around in vector space. All of this is the future of expanded cinema. But the most important thing is that the avant-garde alliance of artist and metadesigner must empower us to control the contexts of our representations, whatever they may be. To learn more about Kit Galloway’s and Sherrie Rabinowitz’s visionary art, see www.ecafe.com. Erkki Huhtamo works as Professor of Media History and Theory at the University of California Los Angeles, Department of Design | Media Arts. He is a media archaeologist, author, and exhibition curator. Gene Youngblood was a foundational critic of the Los Angeles avant-garde. Beginning in the early 1960s he wrote about local culture and cinema for the ‘Los Angeles Herald-Examiner’ and eventually for ‘The Los Angeles Free Press,’ he also hosted a weekly radio program on KPFK. His writing provided foundational insight into the Los Angeles avant-garde, psychedelic culture, and experimental uses of technology. 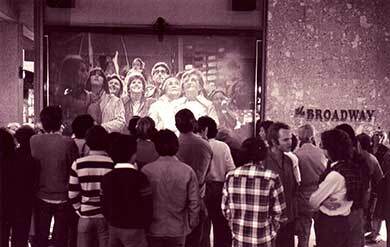 In 1970, he consolidated these ideas into a volume entitled EXPANDED CINEMA, a comprehensive alternative to New York-based perspectives on experimental film. Youngblood was also a founding member of the faculty in the Critical Studies department at the California Institute for the Arts. He is currently working on a book series and documentary regarding his life called SECESSION FROM BROADCAST: GENE YOUNGBLOOD AND THE COMMUNICATIONS REVOLUTION.